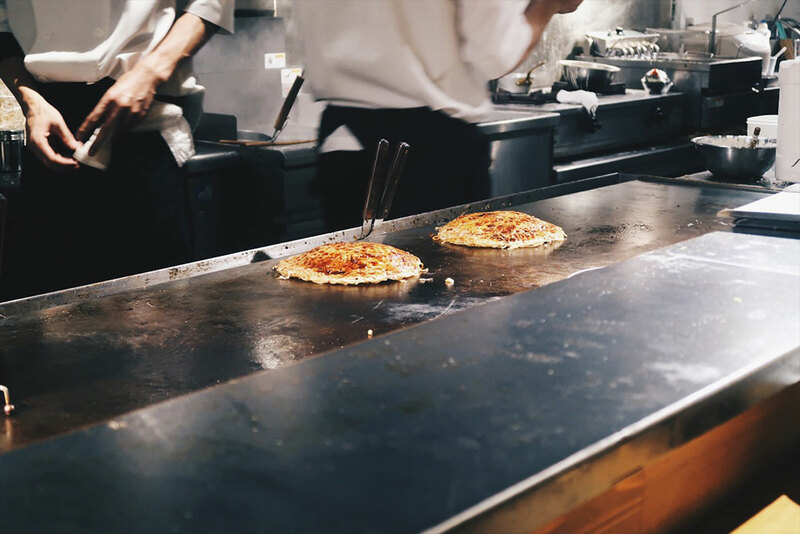 Of course, Japan is – amongst many other things – also home to origami and delicate paper art, tech innovation, and some of the best food this world has to offer; it’s an arts and crafts practitioner’s fantasy, any self-proclaimed techophile’s dream destination, and a food lover’s paradise. 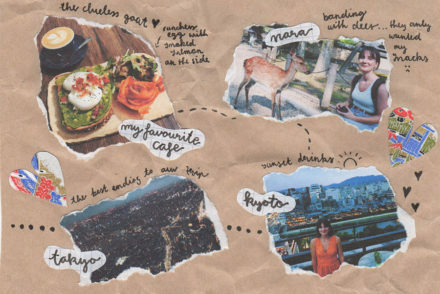 Safe to say, it ticked more than enough boxes for me to catapult it to the very top of my ‘one day, hopefully – a girl can dream’ travel bucket list years ago. 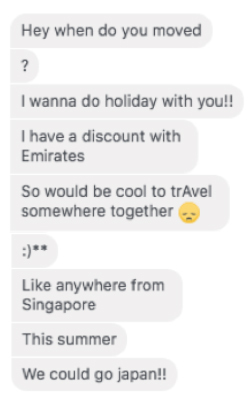 When my move to Singapore last September halved the distance between Japan and I, that goal suddenly no longer felt out of reach. …it didn’t take much convincing on her part. 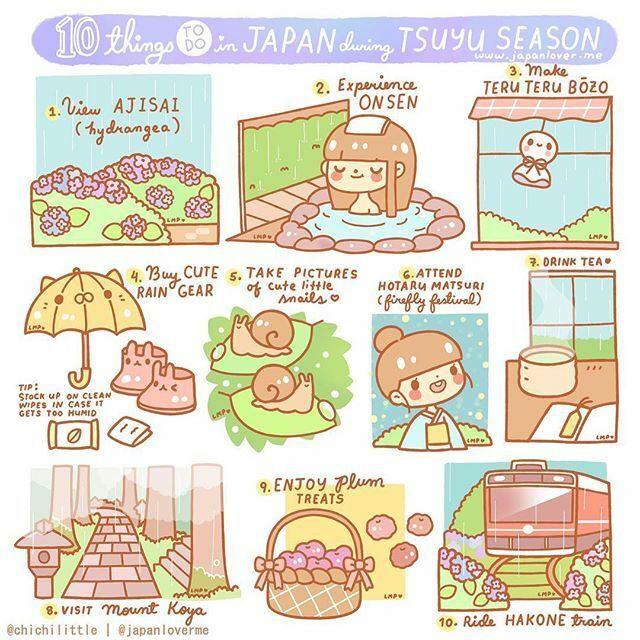 After maneuvering our travel plans around my Singaporean bank holidays, we booked flights within a week and started to step by step stitch together our itinerary, consulting friends, family, and adorable ’10 things to do in Japan’ cartoons on the Internet. 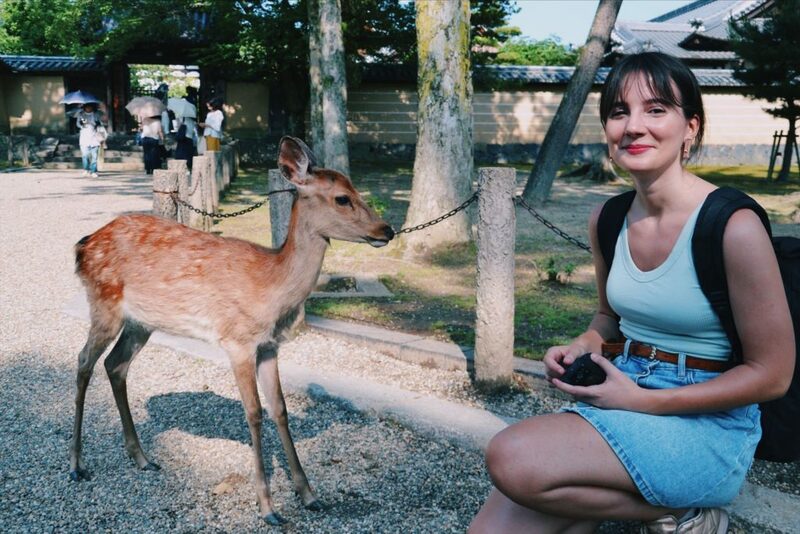 Overall, we pretty much nailed our 12 days in Japan, if I do say so myself. It was an incredible trip, our schedule woke up like this (flawless), and I wouldn’t change a thing if we were to do it all over again. So I decided to write up our journey and all the places we visited, in case anyone is looking for inspiration. 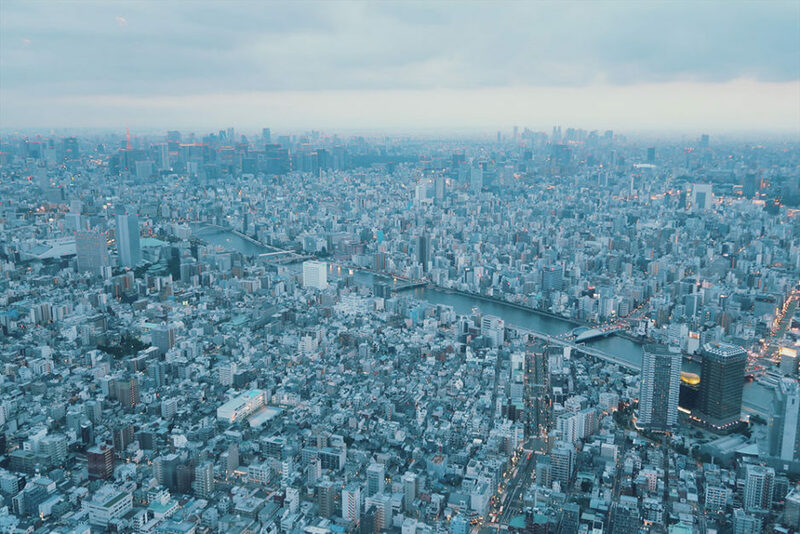 We booked plane tickets separately as Kima flew in from London and I covered the Singapore – Tokyo route on a smooth ANA flight. In Tokyo, I arrived at Haneda airport and departed 12 days later from Narita. 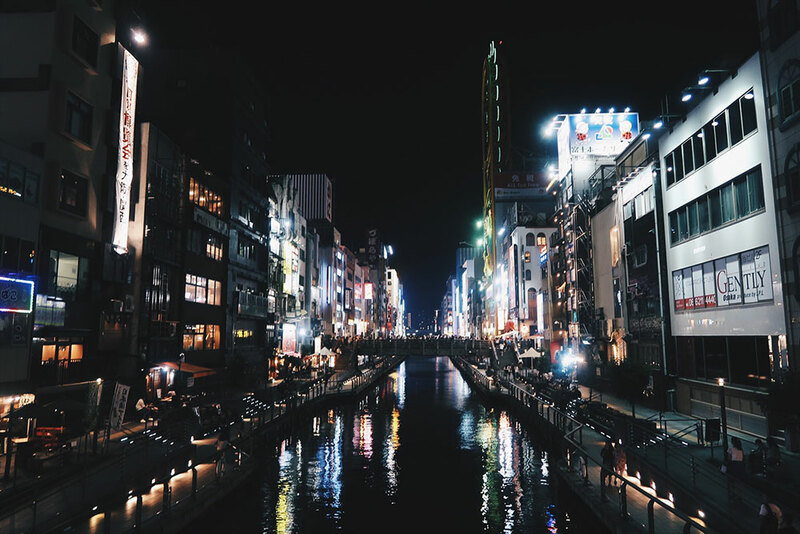 Haneda is significantly closer to the city center and easily accessible via metro; getting to Narita is a bit more expensive as you have to take a designated express train, but it’s equally easy and still pretty speedy. For the first seven days of our trip – the travel-heavy days – we were proud owners of the JR pass, a train pass for foreigners that, admittedly, doesn’t come cheap (it set us back around 170 pounds) but entitles you to take as many Japan Rail trains as you please. This includes the very pricey but brilliant Shinkansen trains, the famous Japanese bullet trains that get you across the country in what feels like no time at all (see below for an entire paragraph of me gushing about trains, if you’re into that kind of stuff). The pass also covers all local JR trains, so unless you are going rogue (as we did on our trip to Koya-San) you will only need to pay for the local metro on top of that. We definitely milked our JR pass, taking a total of seven bullet trains in seven days. If you can, get a seat reservation in advance at the JR ticket office to truly travel in style. Kima brought a Lonely Planet guide along to Japan and I prepared tourist data-only SIM cards for the both of us, which I purchased in advance at a Japanese travel agency called JTB in Singapore. 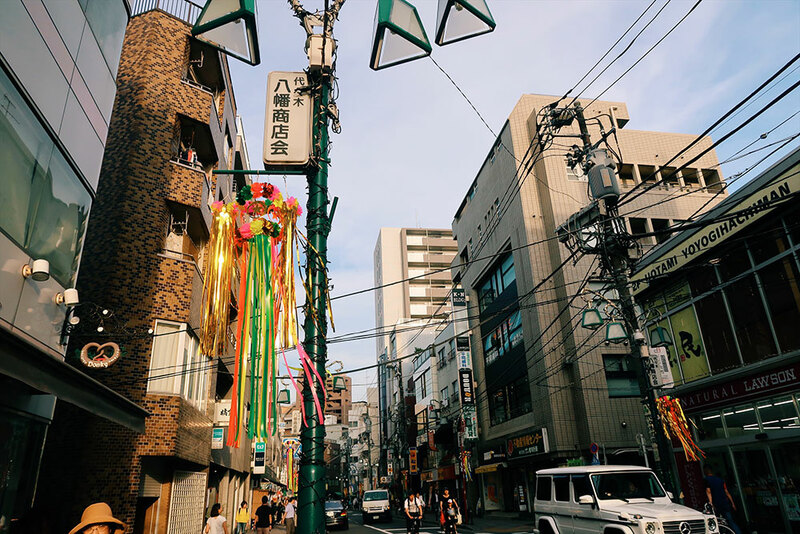 I paid about 20 pounds for 7GB of data – what can I say, I like to stay connected, and instant access to Google Maps & Citymapper turned out to be a real lifesaver; navigating cities offline can unsurprisingly get tricky in Japan. I also bought our JR passes in person at JTB – you pick up the real deal in exchange for your receipt at a JR ticket office once you arrive. I’d really recommend JTB – the staff were so lovely and helpful and I’m pretty sure they have several branches in Europe, too. 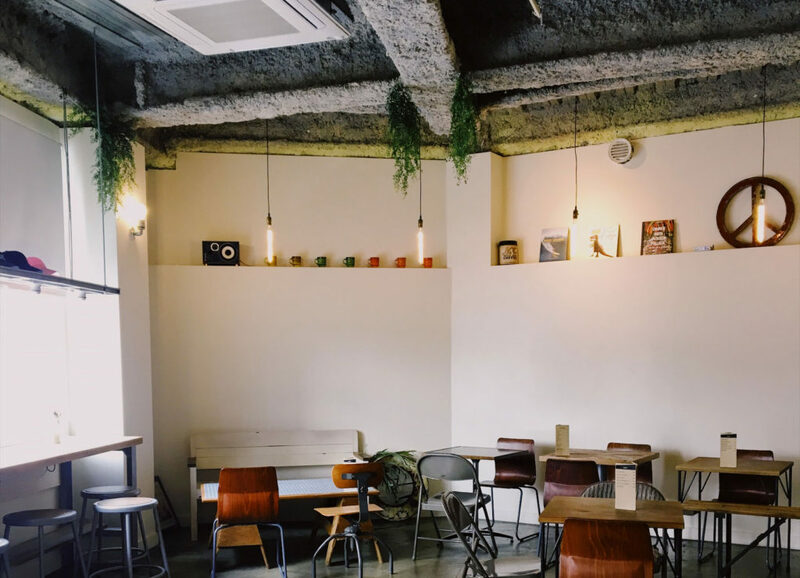 We didn’t want to worry about splitting all expenses evenly, so we used an app called Tricount that Kima dug up god knows where to keep track of who paid for how many matcha lattes. By the end of our trip, we managed to achieve an almost perfect balance, so that was a success. We ate some very memorable food on our trip. 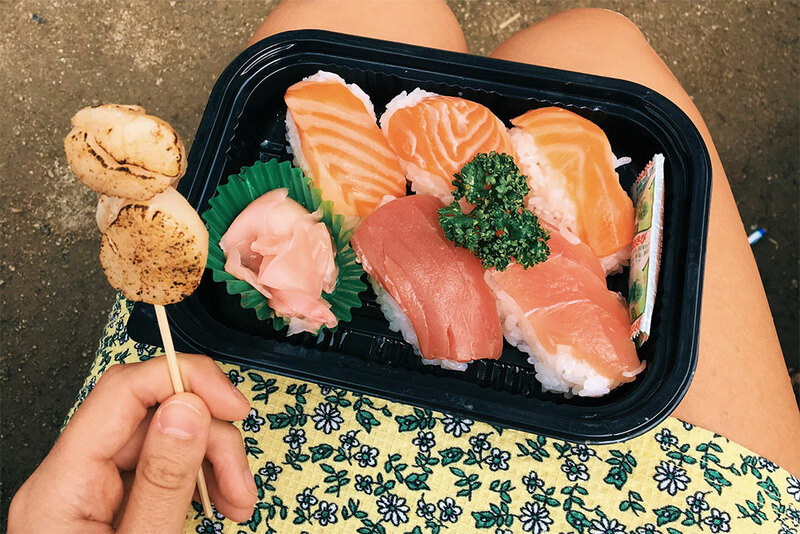 I’m going to mention most of the places that wined & dined us below in the itinerary, but usually, our meal plan would look like something like this: First, we’d pick up some onigiri and/or other fun to-go food at a convenience store of our choice in the morning. 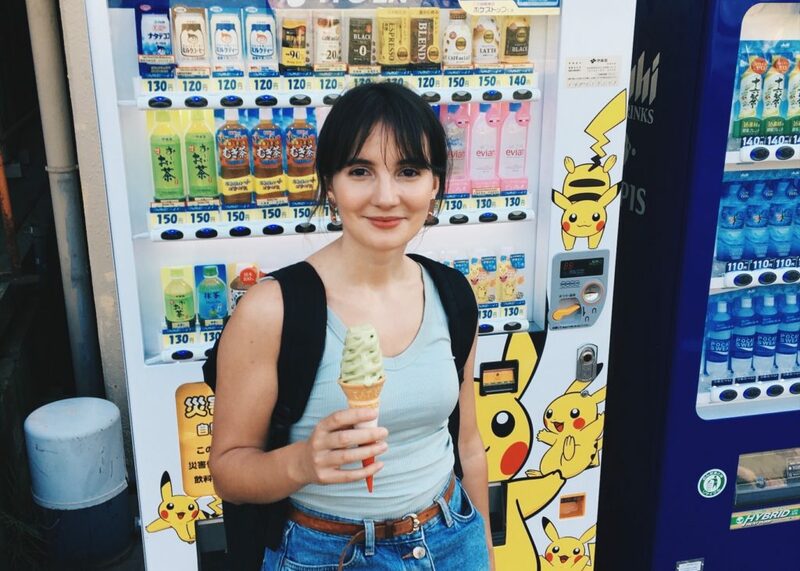 Familymart was our favourite, though Lawsons and 7-11 do the job, too – convenience stores in Japan have a great selection of tasty, cheap food, so don’t underestimate them. 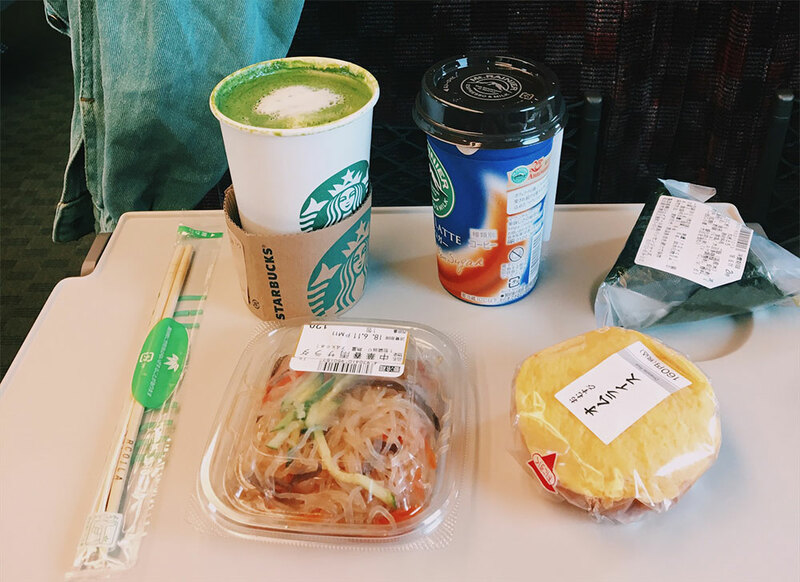 We would usually also have a small-ish lunch on the go, most days treat ourselves to a Matcha cookie or similar for an afternoon snack, and then – within reason – go wild on dinner, chasing friendly suggestions, Tripadvisor reviews or just our gut feeling around town. 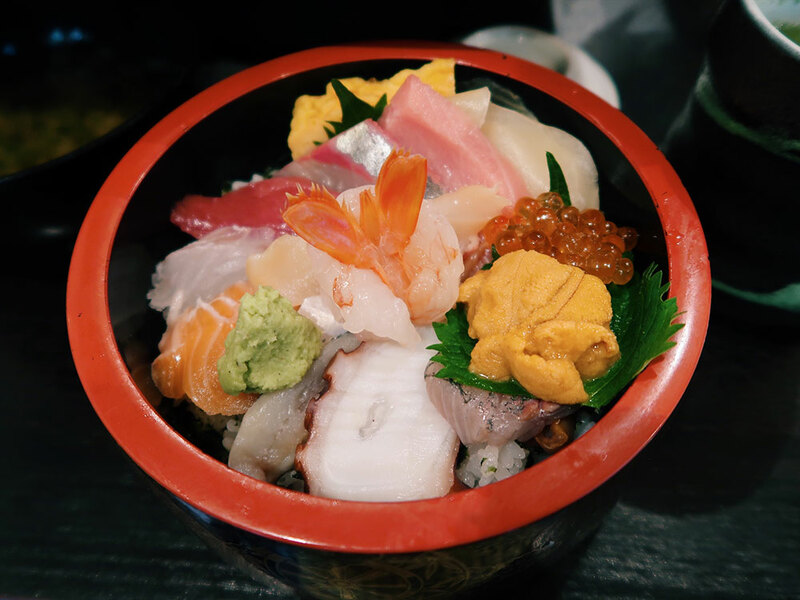 With the exception of sushi at the fish market in Tokyo, we rarely ended up paying more than 10 or 15 pounds for restaurant meals but definitely did not compromise on taste or quality. We also drank a lot of matcha lattes. I innocently looked up their nutritional value post-trip (there’s gotta be some protein in there, right? ); turns out, they are little sugar-dripping meals on their own, especially if you purchase them at Starbucks. I have no regrets though – I wasn’t a huge fan of matcha before our trip but I’m a convert now. A tip: If you tend suffer from the red wine lip phenomenon (that’s me), prepare yourself for the matcha lip; unless you look good in green, it’s not a cute look. Now, let’s get into this! On our first night, I landed at Tokyo Haneda airport at around 7pm in the evening and patiently waited for Kima’s plane to arrive. As usual, she was slightly delayed, though through no fault of her own this time. 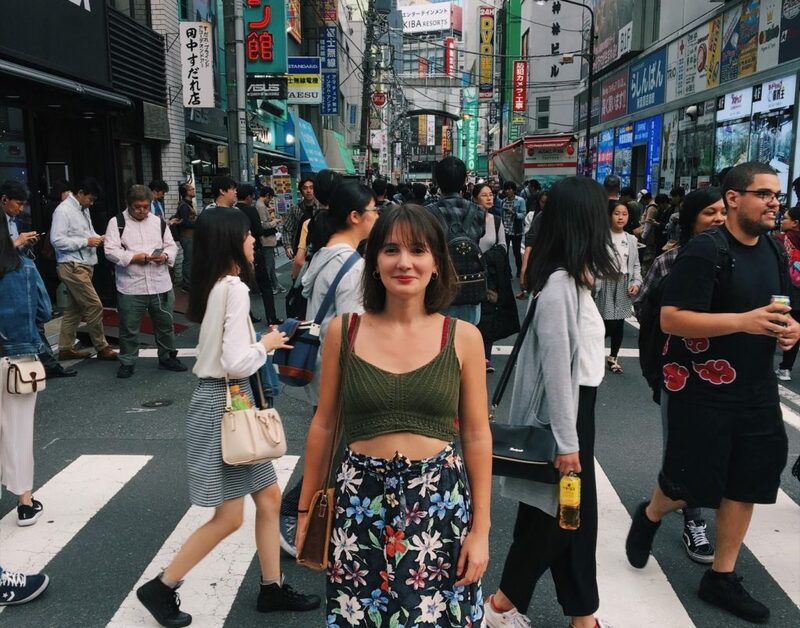 Once she arrived and we realised we were embarrassingly wearing the exact same plane outfit (comfy black pants + breton shirt), we took the subway to Ginza, where we spent our first night. 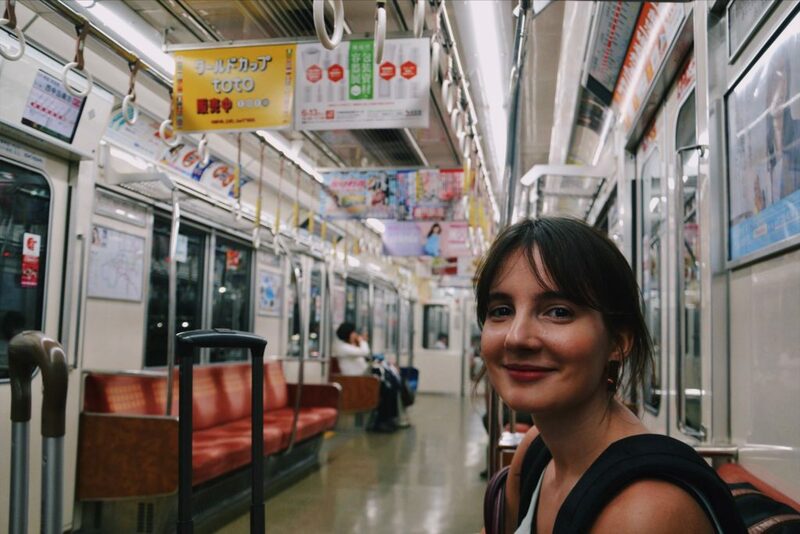 I immediately fell in love with the Tokyo subway and its vintage meets modern vibes, and luckily so, as this was the first of many times that we would accidentally get on the wrong train. After this self-induced unnecessarily lengthy journey, we arrived at our first capsule hotel, the Prime Pod Ginza, which was a very convenient choice for sleeping off a long flight. The only downside is that you have to leave your suitcase in a big storage room, but the capsule beds had chargers and lockers and even small TVs, which, as I later found out, Kima used to watch Pokemon the next morning – no comment. I strongly disliked the bathroom lights – way too bright to have a relaxed getting ready session in the morning – but I’m also very particular about my lights; everything else was very cosy and it was astonishingly quiet considering the sleeping hall fit about 25 people. 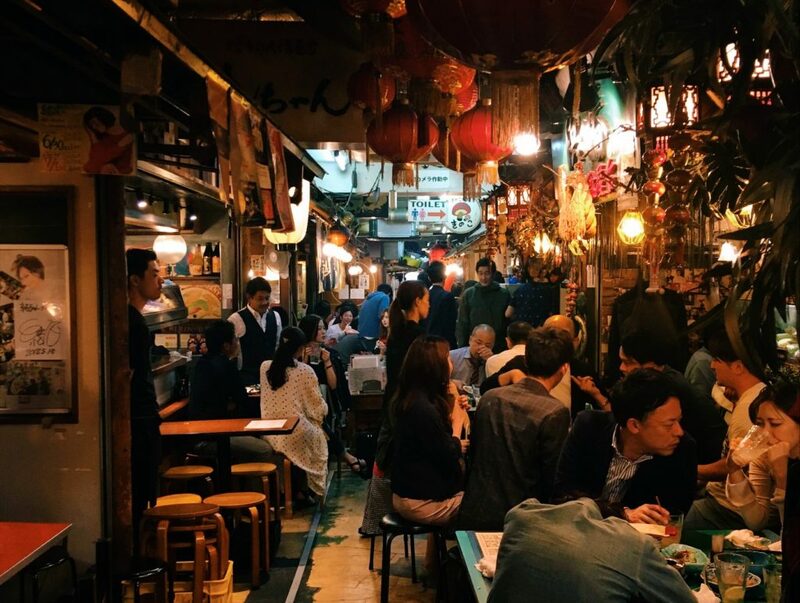 For late-night food, we stepped outside and into the next best Ramen place that looked like it would get food into our bellies within 15 minutes or less (we were starving at this point) and – crucially – also let us order from a menu with pictures. Another first – we ordered our meals at the ticket machine by the entrance, with some help from a lovely gentleman who took pity on us in our disoriented state and explained the whole process. I slept like a well-fed baby that night. On the second day, we picked up our JR pass from Tokyo Station and embarked on a first speedy ride to Osaka. Okay, no surprise here, but the Shinkansen is AMAZING. I love trains and have a very romanticised view of train journeys, so I was originally a little worried that the bullet train might be so modern there would be no cosy charm aboard. That was not the case at all – these trains are beautiful, inside and out (and they certainly know it). A friend of mine alerted me to the fact that their sleek design was inspired by the beak of the kingfisher; that’s how Japanese engineers avoided the loud booming sound usually created when you move at such crazy speed (he didn’t tell me that bit, I looked it up to sprinkle some fun facts into this post). The inside is spacious, even in second class, and the seats are so comfortable. 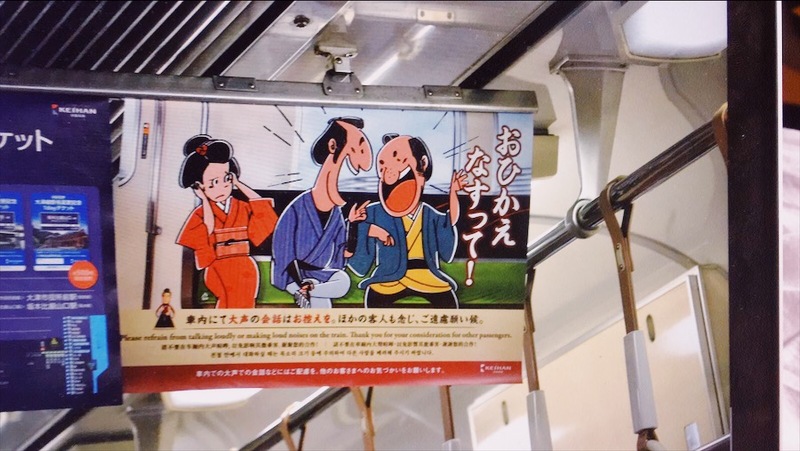 Bullet trains don’t turn around, so instead, the seats are rotated 180 degrees at the end of each journey – genius. You can also make use of that yourself if you’re traveling in a big group and want to face each other. Wouldn’t be for me, but not everyone wants to plug in headphones and kick off the daydream as soon as the wheels start turning. I will stop gushing about trains now, but these ones are quite something. At Osaka station, we left our luggage in storage and headed to beautiful Nara for the day. Dare I say – this first day was potentially the most wholesome day of the entire trip and a lovely start to our travels. 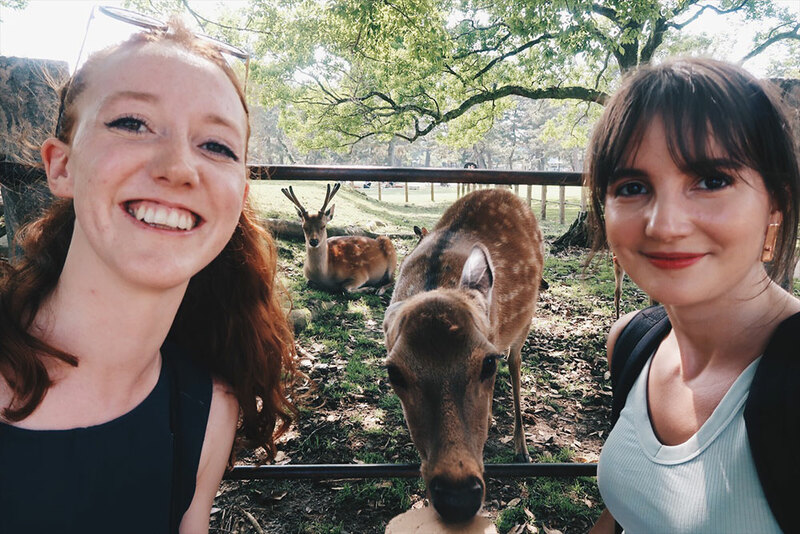 The sun was shining, the deer were bowing, we purchased biscuits (for the deer) and sesame and matcha ice cream (for us), visited Todai-ji, a beautiful wooden temple with a very impressive bronze Buddha statue, and wandered around town and the surrounding parks. I even got a tiny tan, which is how I measure a successful day in the sun. In the early evening, we headed back to Osaka and checked into our Airbnb, which was located in Shinsaibashi, a fairly central area. We had another Spanish-style late night dinner (that’s what you get when you travel with a Spaniard) at a very affordable place called Torikizoku in Nanba – you know the meal’s going to be worth it when you have to queue for 20 minutes. I loved ordering on our personal tablet, too – when all you need is to press a button, it’s a crime not to go for seconds. This was also my first run-in with spicy cucumber salad, which I didn’t realize I am kind of obsessed with and have since tried to recreate at home. I used to tell people in a hushed voice that I’m not a big fan of cucumbers (they’re just water but with a weird taste) – no more of that nonsense. On our second day, we took the Shinkansen from Osaka down to Hiroshima. Overexcited, we managed to miss our stop at Hiroshima (I can neither confirm nor deny that we were taking a selfie the very moment we realised that our train had both entered and left the station), which added an extra hour or so to our journey and led to a stop-over in a small-ish town where a tall ginger was definitely an unusual sight. In Hiroshima, we stayed in a hotel called Urbain Hiroshima Executive right next to the station, inhabiting the tiniest room I’ve ever seen. The shower and breakfast were good though, which is more important to me, and the room was convenient and great value for money. 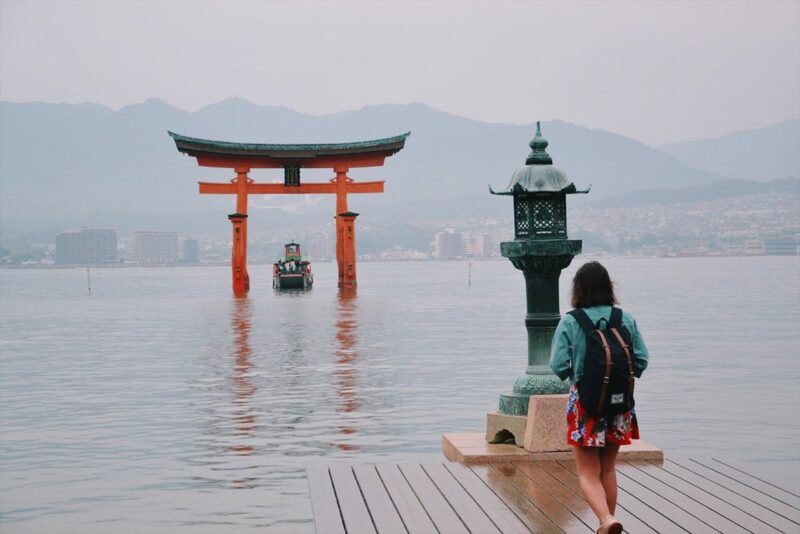 In the afternoon, we took the train and ferry to Myajima, the island most famous for its shrine and the highly photogenic huge red torii gate that appears to be floating on water. 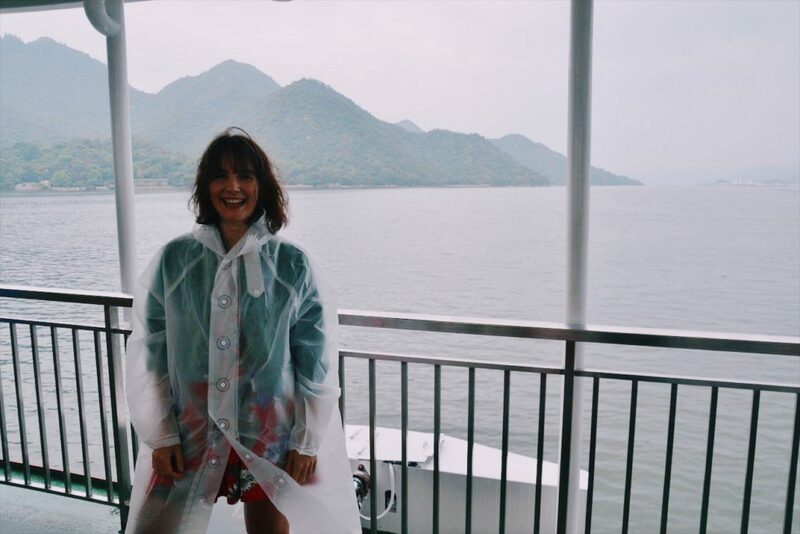 It was a wet afternoon; the constant drizzle that occasionally turned into proper rain made our original plan – hiking up the biggest hill on the island, Mount Misen – considerably less appealing, especially after a few initial wrong turns (I’m starting to see a pattern here…); not even my trendy translucent white rain coat, courtesy of 7-11, could turn things around. 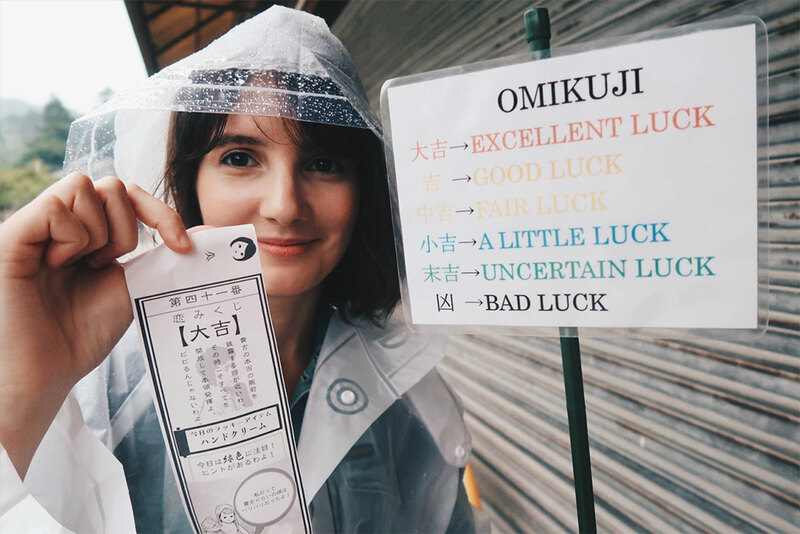 So we kept our trip pretty casual, had some street-side snacks, and consulted our fortune via the Omikuji pictured below. I would just like to point out that my Omikuji predicted Excellent Luck (first from above) while Kima was merely blessed with Fair Luck (third from above). Apparently my fortune also said something along the lines of: “The time when you will demonstrate your true ability is nearing. At that time, bring in your skill with no reservations. Don’t be nervous.” Very exciting! I’m ready. I was born ready. In the evening, we had Okonomyiaki at a lovely restaurant by the station (I could only find its Japanese name online – 鉄ぱん屋弁兵衛広島駅北口店 ) after walking around Hiroshima for about thirty minutes trying to hunt down various >4 star Google recommendations, which all turned out to be closed on a Sunday evening. The next day, we visited the Hiroshima peace memorial museum – the main purpose of our trip to Hiroshima – which was very interesting and very sad and definitely worth the wet walk across town. 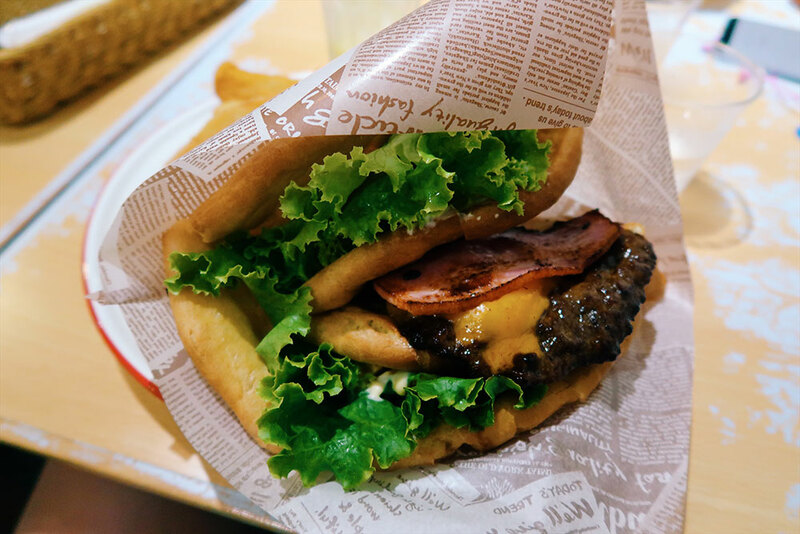 Afterwards, we ate our feelings in the form of a juicy teriyaki burger at McDonalds (when in Rome…kind of) before we boarded the afternoon train to charming Kyoto. In Kyoto, we stayed at the book & bed, a capsule hotel that’s essentially just one big library, with beds nested in-between bookshelves. It was a dream come true. 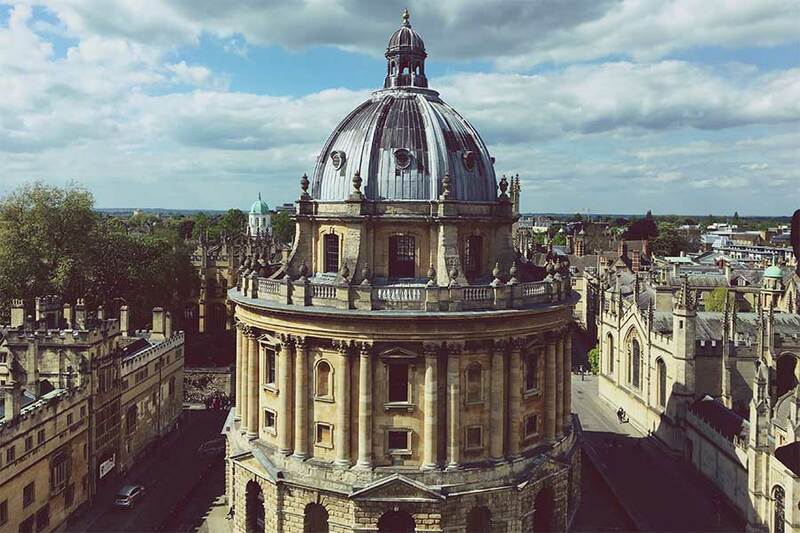 I had bookmarked this place years back when I first found it online, and it lived up to my astronomical expectations – the staff were helpful, it was quiet and nerdy and just all-round lovely. If someone were to design a capsule hostel specifically tailored to my interests, it would probably look very similar to this. I even managed to get through 1.5 very average romance novels while we were there. 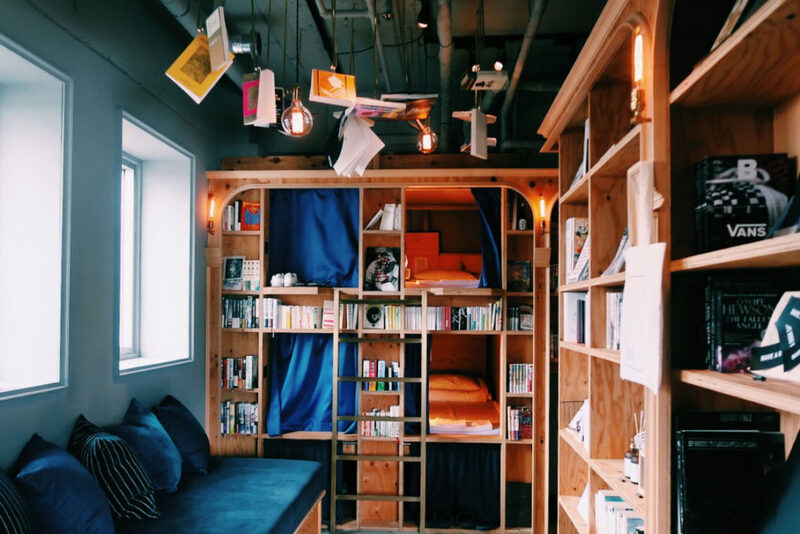 The book & bed has branches around Tokyo, too, so if this type of place appeals to you and you’re looking for an affordable alternative to a hotel that’s almost as private and definitely just as quiet, check it out. 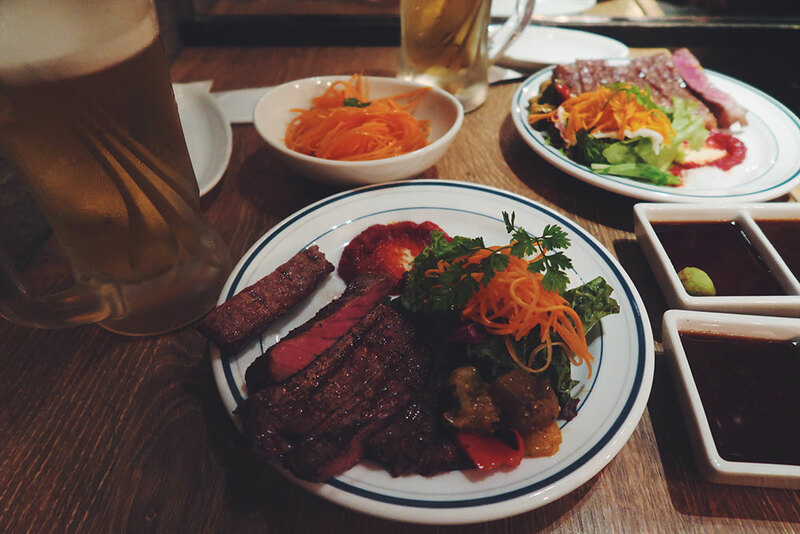 It was already pretty late when we arrived in Kyoto on that first night, so we headed out for dinner to the neighbouring Pontocho Alley across the river and had a delicious meal at a tiny restaurant aptly named Steak & Wine. 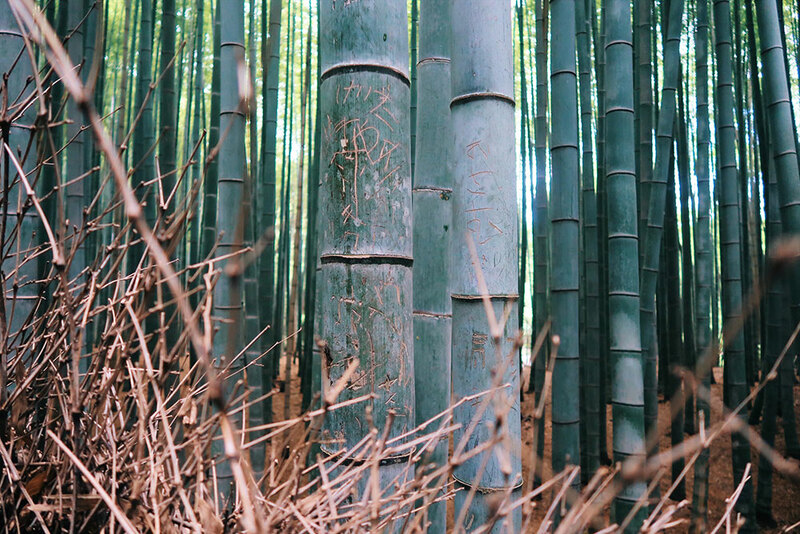 The next day, it was time to get seriously bamboozled at the Arashiyama Bamboo Grove, a Kyoto must-see. We left early-ish to beat the crowds but failed miserably – hordes of schoolchildren were already on their way back when we reached the local train station. We also initially took a wrong turn (again?! come on) and found ourselves walking through a, MUCH, smaller Bamboo grove, which we first assumed was the main event. It was deeply underwhelming but we put on a brave face to keep up team morale. In hindsight, the fact that we were basically the only ones there should have been a hint. Luckily we eventually realised that this was not the famous otherworldly experience we had been promised and found the right path. Afterwards, we made it up the hill to Iwatayama Monkey Park. The monkeys were expressive little guys and very talented at posing (see below). 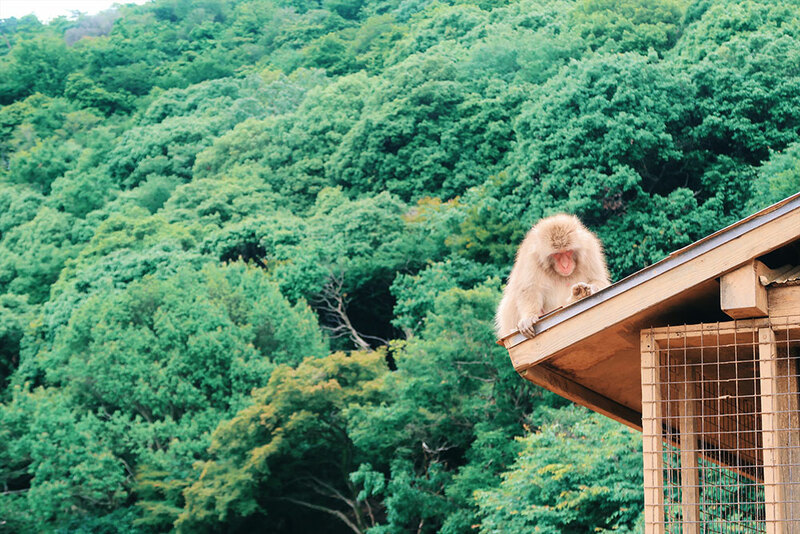 If you’re lucky, you can get very close – but not too close – to a bunch of tiny baby monkeys and their angry mums. 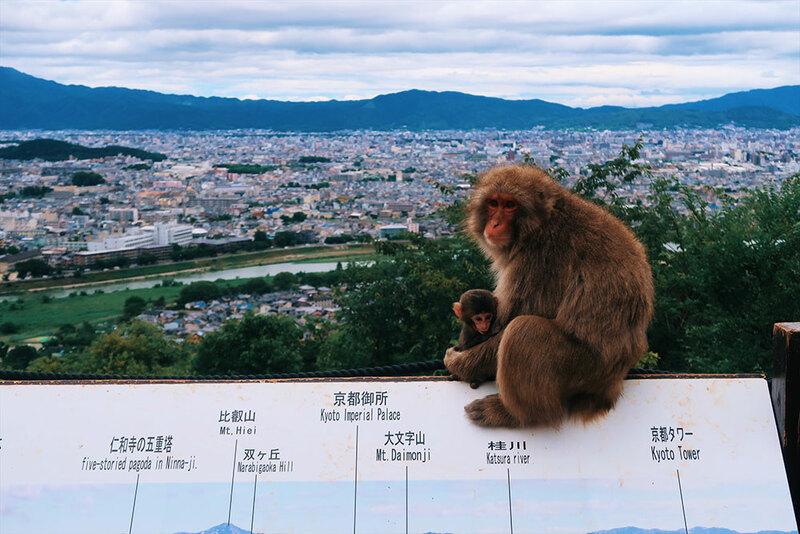 But even if our small, agile hairy friends aren’t your cup of tea, you have a beautiful view of Kyoto while you’re up there (my dad would have definitely taken a panorama pic…). 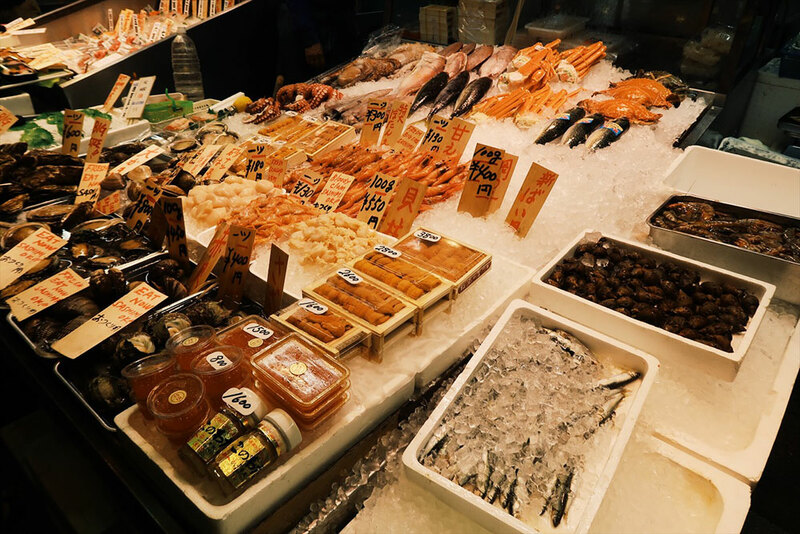 After ticking off that part of town, we headed to Nikishi market to look at food and also to finally eat some food. Nikishi was a feast for all senses and the sushi we bought there was freaking delicious. My favourite were the grilled scallops though – perfection on a stick. Post lunch, we briefly stopped at a stationery shop to buy Japanese paper (me) and postcards (Kima) before taking the bus across town to check out Ginkaku-ji temple, a serene temple complex. The bus presented a challenge in itself, but we eventually figured out that you pay when you get off (figuring out = frantically googling Japanese bus etiquette in a race against time). For dinner, Lonely Planet guided us to a very nice Okinawan-style (south of Japan) Restaurant called Goya a short walk from the temple. As neither of us had tried Okinawan food before, we opted for the taster menu that allowed us to sample a little bit of everything, had Okinawan cocktails, and enjoyed the laid-back atmosphere of the place. A more successful cartoon-inspired activity, however, was Koya-san (bottom left). Koya-san is a beautiful Buddhist temple settlement with over 100 temples, first established in 826. 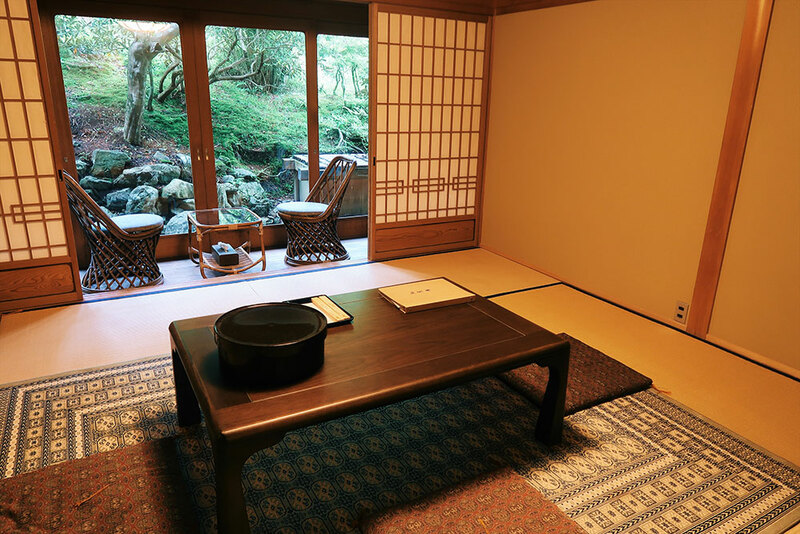 If you’re in a hurry, you can do a day trip to Mount Koya, but what you should really do is book an overnight stay at one of the temples that accommodate guests. We picked Ekoin temple because the monks there offer a guided night tour of Okunoin Cemetery, the largest cemetery in Japan where over two hundred thousand Buddhist monks have been buried over the centuries. Getting to Koya-san was slightly challenging (naturally, since it’s a remote village in the mountains) but it was such a lovely journey. We took the Osaka Loop Line from Kyoto to Shin-Imamiya, where we switched to the Nankai-Koya line (you can buy discounted ticket packages for Koya-san there, which include a bus pass and the cable car) and enjoyed a rather picturesque journey through the mountains to Gokurakubashi. 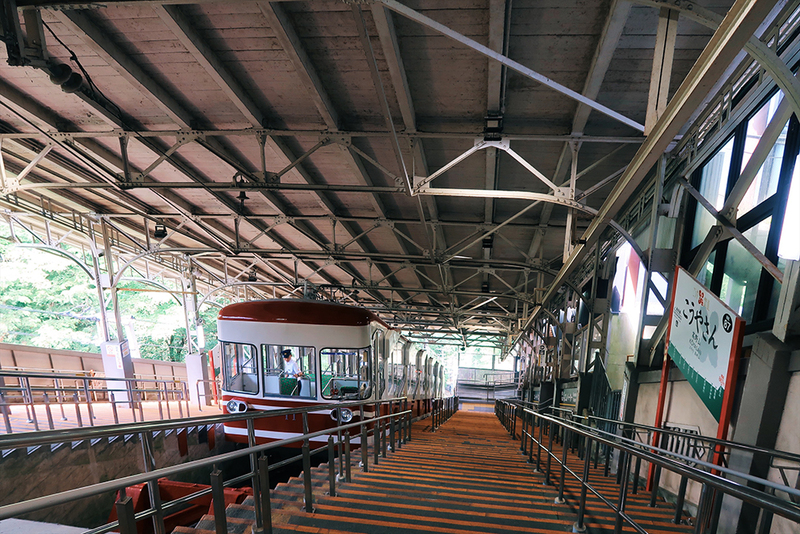 There, the best part of the trip begins – a quick but stunning uphill ride in the cable car pictured below. Once you’ve arrived in Koya-san, you take a bus to your temple. Ekoin temple is 1000 years old, beautiful in its simplicity and very serene. You can’t wear shoes inside so instead you are asked to change into slippers when you arrive. A fellow German tourist who arrived at the same time as us managed to somehow walk around in way too tiny slippers for the entirety of this stay (we’re talking probably five or six sizes too small), not realising that there were actually various sizes available for bigger feet. This little detail never failed to amuse us whenever we bumped into him. We slept in a traditional Ryokan, had super tasty vegetarian cuisine for dinner and breakfast (and might have had some matcha kit-kats; not provided by the temple), went to the onsen (my first time) and got spooked during our night-time cemetery walk. 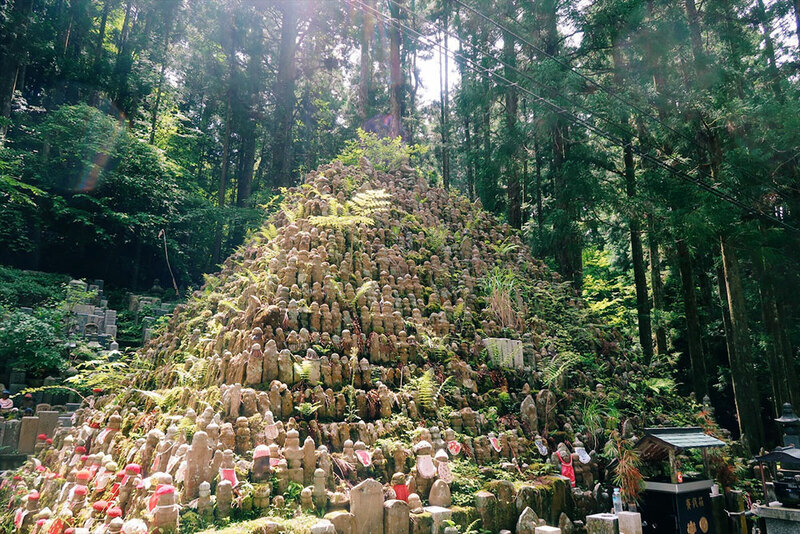 Okunoin cemetery is the site of the mausoleum of Kobo Daishi, founder of the Shingon Buddhism practiced on Mount Koya, who is said to rest there in eternal meditation – the monks still bring him meals three times a day in a special ceremony. My favourite part of the tour was our guide, a young monk with a soft spot for spooky stories. He warned us that if you trip over a particular set of steps (there are a lot of steps, so make sure to remember which ones exactly), you only have three years left to live. Spoiler alert: we’re fine for now, but imagine a huge group of tourists focusing on their each and every step while our guide waited by the side of the path for everyone to pass safely, repeating ‘remember, three years, three years’ over and over. And once you think you’re safe, you find out that if you can’t see your reflection in a particular well, the same fate awaits you – just great. Again, I can confirm that we’re fine, though I was honestly slightly worried beforehand – if you didn’t see your reflection, surely no one would believe you! Then what? We returned the next morning before we left Koya-san to explore the place in daylight because once our tour was over and we were left to our own devices, I was rather keen to get back to the temple asap. Getting lost in the darkness amongst 200 thousand graves is not something I was particularly keen to explore, no matter how friendly the spirits might be. 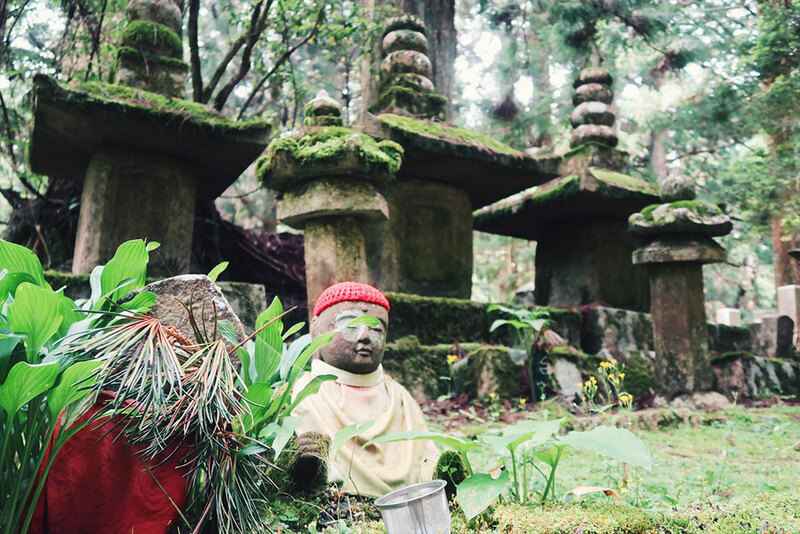 The cemetery is full of these little statues of Jizo – the protector of the souls of unborn children and those who die young – dressed up in knitted caps and red bibs; gifts by mothers seeking to protect their children. Apart from the night tour, Ekoin also offered a guided meditation session in the afternoon, which only served to cement my belief that meditation is just not for me – it’s the only time I ever get fidgety in life, so I’ll stick to HIIT to clear my mind instead. We also rolled out of bed to attend the 6am morning ceremony and fire ritual and were embarrassingly interviewed by a Japanese TV station about our experience afterwards – I pray that this footage will never see the light of day. Our trip to Koya-san was the first time I regretted not bringing a jacket. 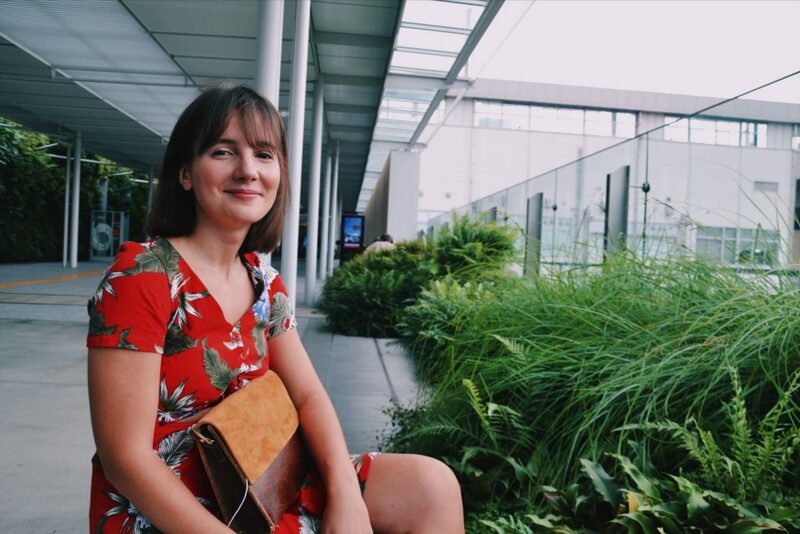 I essentially packed for Singapore weather, expecting to stay warm and sweaty every day – rainy season, right? Big mistake. I had to layer up for the night tour, and also to walk to the bathrooms at night because the temple was freezing (reminded me of the good old days in Scotland). Before we left, we had lunch at Bon-on-sha, a cute little café – they have a tasty vegetarian set lunch menu. 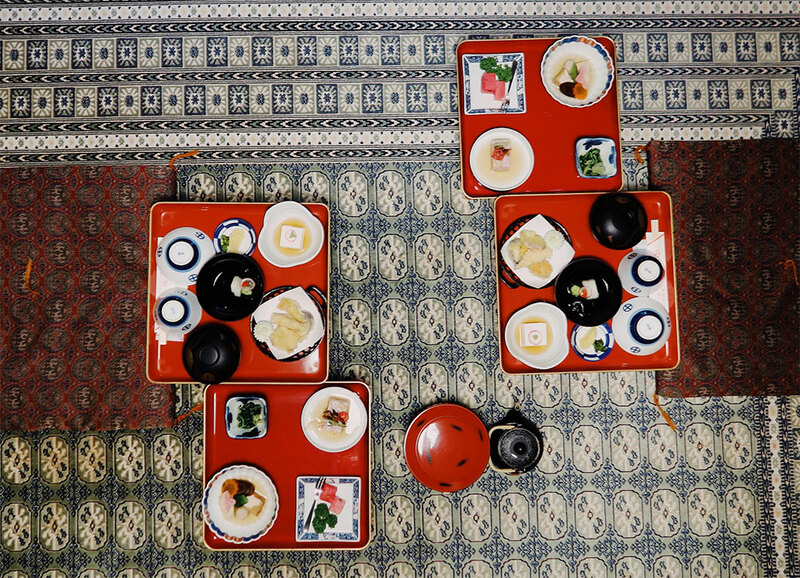 After we arrived in Kyoto and checked back into the book & bed, we wandered around and engaged in a little bit of cheeky shopping – meaning, I did some cheeky shopping, dragging Kima along with me. I bought some famous aburatorigami (oil blotting papers originally designed for stage performances, and ideal for Shiny McShinefaces like me) from a Kyoto-based cosmetics store called Yoyijya and a mint make-up bag at Ichizawa Shinzaburo, a traditional tote bag manufacturer. In the evening, we had drinks on the roof of the hostel and witnessed the most incredible sunset. The last time I saw colours this bright was during one epic morning in Edinburgh that will forever be remembered as the morning the sky was on fire. For dinner, we ate Ramen at a small restaurant called Musoshin – it was super tasty and incredible value for money, I very much recommend it. 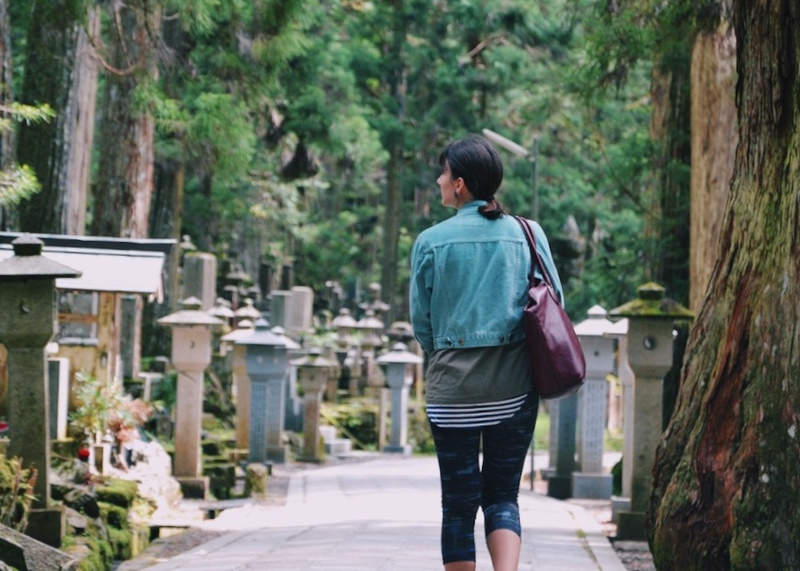 The next morning, it was time to tick off another Kyoto must-see – the Thousand Shrines. It’s actually a pretty long walk up the hill, so I was pleased to get a little workout in, especially as our initial plan to go on regular runs while in Japan evaporated into thin air as soon as we actually started our trip. If I don’t go running at home, what made me think I would start on holiday? 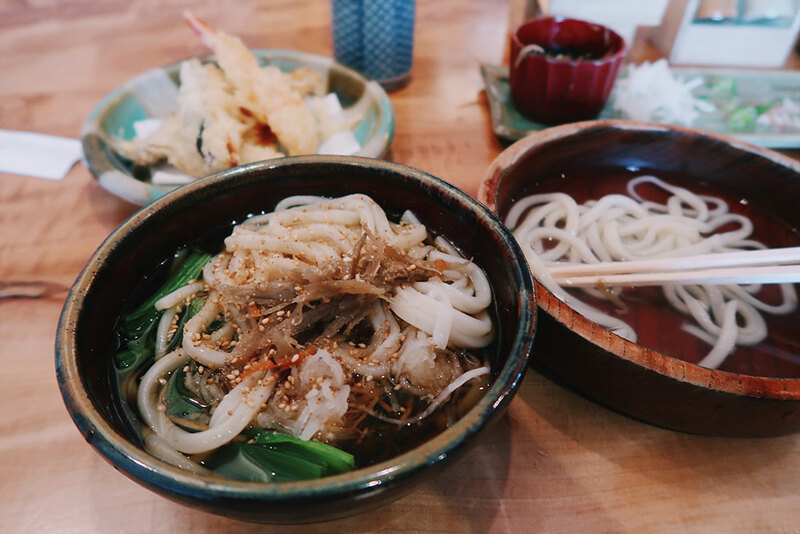 For lunch, we went to a local restaurant chain called Omen and had the most incredible Udon noodles – it’s not exactly cheap but it was so worth it. If you are planning on going, make sure to make an afternoon of it – they close surprisingly early in the evening. Afterwards, we attended a tea ceremony workshop. We were the only two who booked into our time slot so it ended up being a private session. 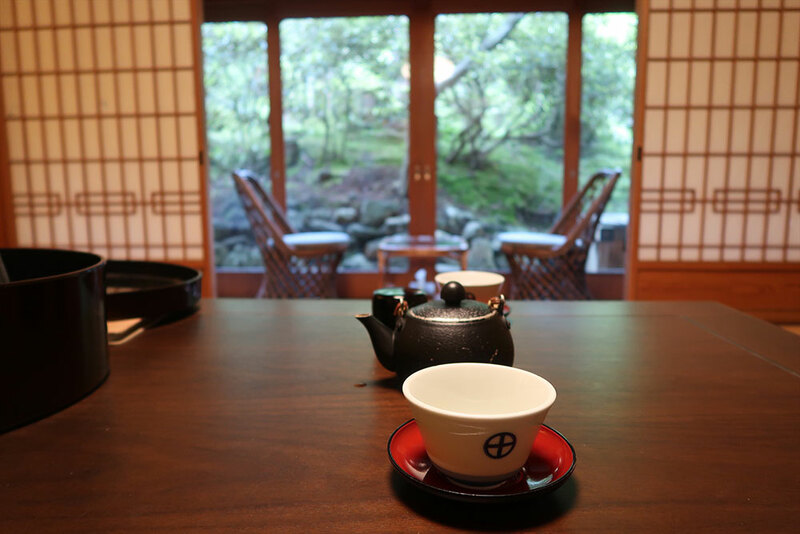 I love the meditative character of Japanese tea prep, but I can’t say that I was a very graceful student, confusing left and right and nervously downing my matcha – practice makes perfect, I guess. This marked the end of our lovely trip to Kyoto. We packed up our suitcases, headed to the station, bought a bento box to eat on the train, and started our journey to Tokyo on a beautiful Friday evening. Just in time – our JR pass expired that same night. 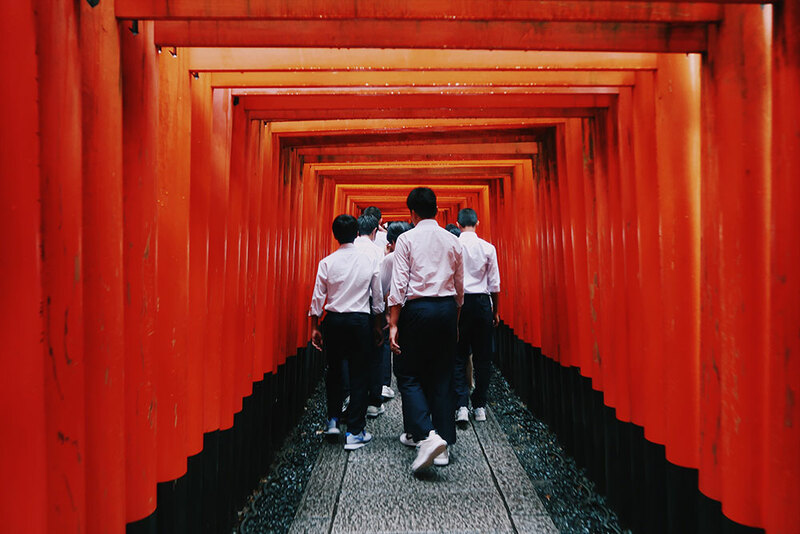 For the last leg of our tour, we spent 4.5 days in Tokyo – and could have easily spent many more there. What a city! 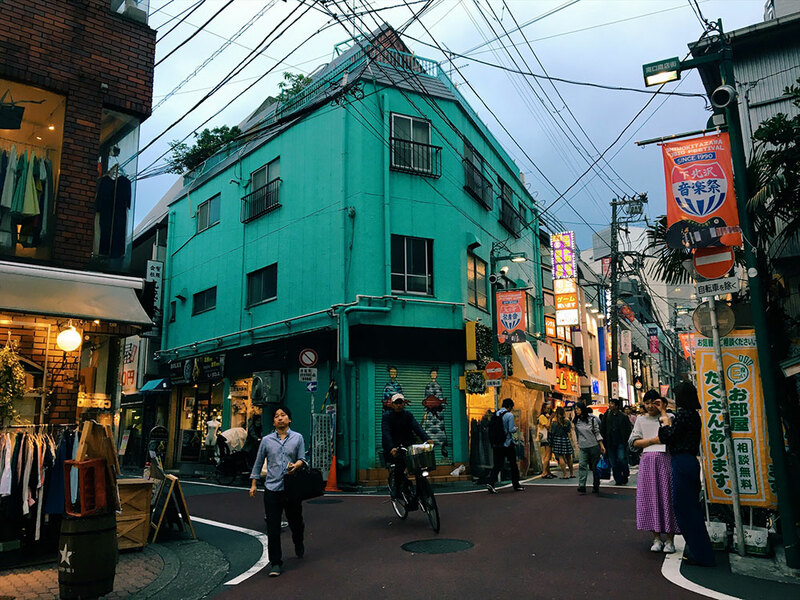 In the end, this change turned out brilliantly, though we were a bit disappointed originally; our AirBnB room included two friendly Shiba Inus – Kima was already imagining us wandering around Yoyogi park with our new furry friends. The Almond hostel was lovely – they have two floors, one mixed and one female only, it’s all white and pretty and the showers are great. The café downstairs is beautiful, too, the staff are super nice, and the hostel is a five-minute walk from the station. The only drawback is that there are only two showers for 15 people or so, so if you’re in a rush you have to make sure to slide into the queue on time. During the weekend, we mostly wandered between Harajuku, Shibuya, Shinjuku, and Shikitizawa. We also checked out Akhibara and all its weird and wonderful shops, and we climbed (alright, took the lift) up the Skytree for a beautiful sunset view of Tokyo. Sashimi at Tsukiji Market: Unfortunately we didn’t catch the 4am fish auction – I’m an early bird, but I’m not that early, so instead, we had a 9am sashimi “breakfast” bowl here on Tuesday morning. Prepare to pay slightly more than you usually would expect to for raw fish in Japan, but it’s worth it. Sushi on Steroids at Genki Sushi: This was my very first conveyor belt sushi experience and I loved every second. It was very cheap, very good and the interior at this place was very pink, which is always a plus. I ate my bodyweight in white rice and probably ordered new rolls every three minutes or so. Incredible (!!!) 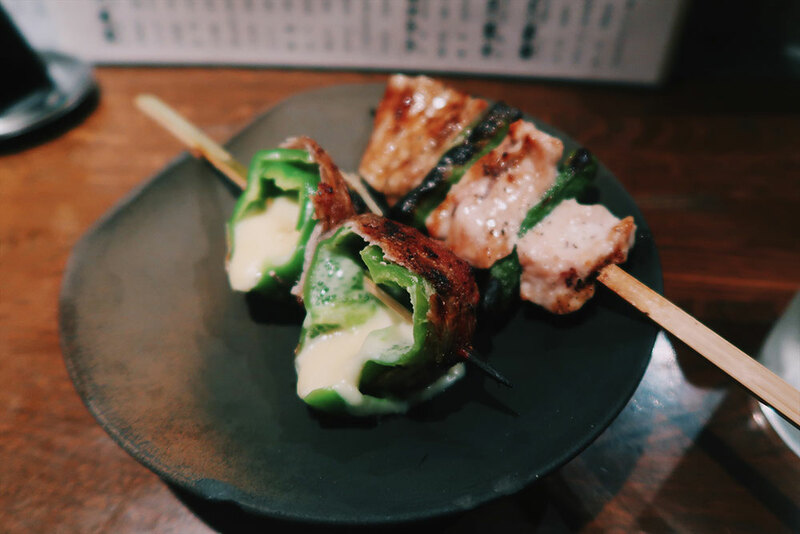 Yakitori at Fuku Yakitori: We opted for this place because it was only 5 minutes away from our hostel and I fell in love – the yakitori here were potentially my favourite food I’ve eaten in Japan. We arrived quite late, so they had ran out of a few items on the menu already, but everything we had was delicious and I was almost tempted to go back the next day. Honestly, it was perfection. Teriyaki Burger at Little Bird Café: Kima was extremely skeptical when I told her this place was gluten-free and also did not have a large selection of local food, but I was not going to let that keep me from going to a place with a straight five star review on TripAdvisor and Google. Safe to say, it was freaking delicious. Starbucks at Shibuya Crossing. Embracing my basic side, I lurked for about 15 minutes until I was able to grab a prime window seat in the Starbucks there to get some work done and watch masses of colourful umbrellas cross the street (sounds like a slightly sad way to spend your day, but it was very entertaining). I can also recommend Tully’s Coffee if you find yourself needing to send an important email while out and about – lots of power outlets, window seats, and solid coffee. Also worth checking out: Ebisu beer hall (pictured below) & the tiny establishments on Memory Lane (“Piss Lane”) in Shinjuku for drinks. 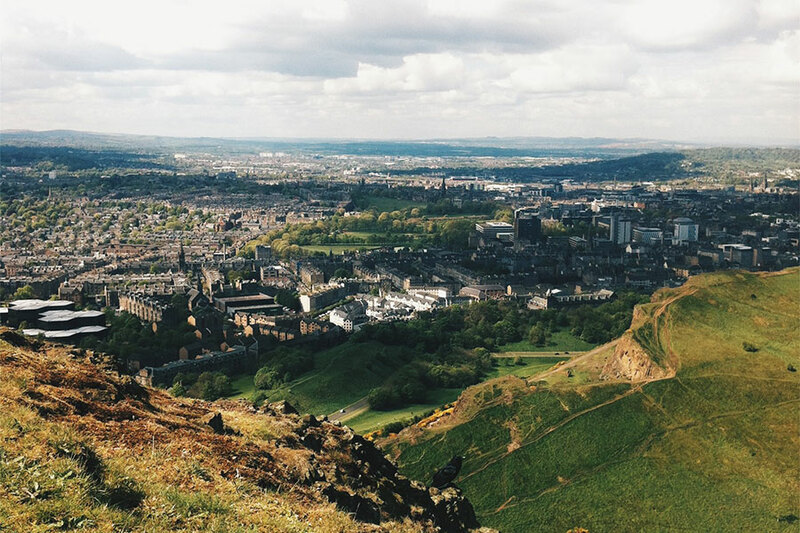 When we lived in Edinburgh, Kima and I regularly made our way to the other side of town on Saturdays for the Vintage Kilo Sale in Leith, where we dug around in overflowing boxes hoping for lucky finds. My signature mint-turquoise denim jacket was a kilo sale purchase! I’m saying lucky but really there’s method in the madness. Anyways, despite the fact that you could count on Kima’s allergies to act up about five minutes into the process, vintage shopping has been a cherished tradition in this friendship from its very beginning. Since the vintage experience in Tokyo is – allegedly – one of the best in the world, we couldn’t miss out on the opportunity to hit the shops together once more. Our vintage shop hopping did not disappoint, and we both found quite a few pieces we were happy with. Here’s the list of stores we visited – personally, I found the best items at Flamingo, Little Trip to Heaven and Grimoire (though the last two are slightly on the pricier side), and ended up squeezing an additional beautiful flowing floral maxi skirt, a pair of delicate gold hoops, a bright green 60s midi dress, a leather bag and an 80s inspired crop top into my suitcase. 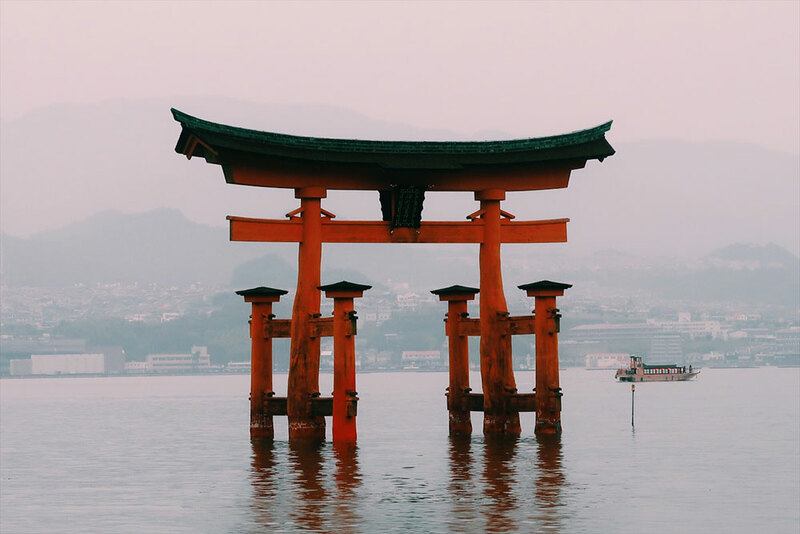 Japan was probably my favourite place that I have ever visited on a holiday. I was amazed by how considerate and polite the people were – after 12 days in Japan, the news of Japanese football fans cleaning up the stadium after a world cup game made perfect sense to me. 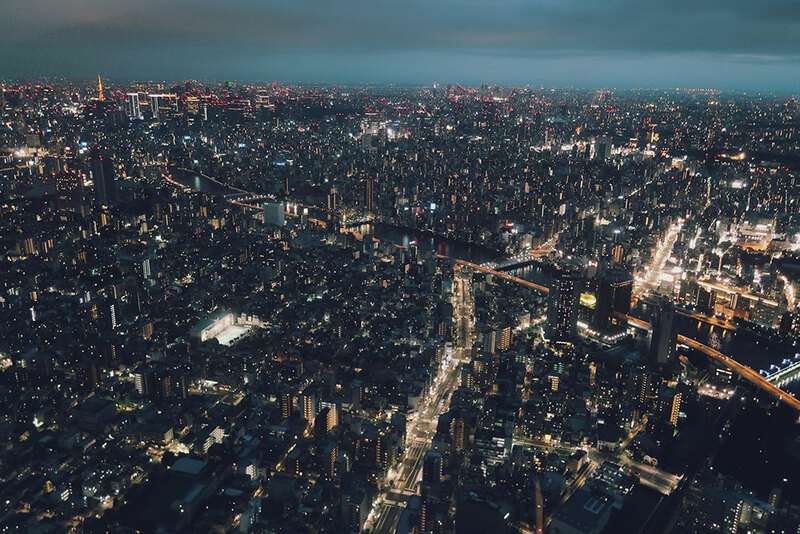 People in Japan are very aware of their surroundings and always strive to make life easier for the people around them – the little things matter, such as pressing the ‘close door’ button just as you exit the lift so the people inside don’t have to do it. Of course, I also had a great travel buddy. 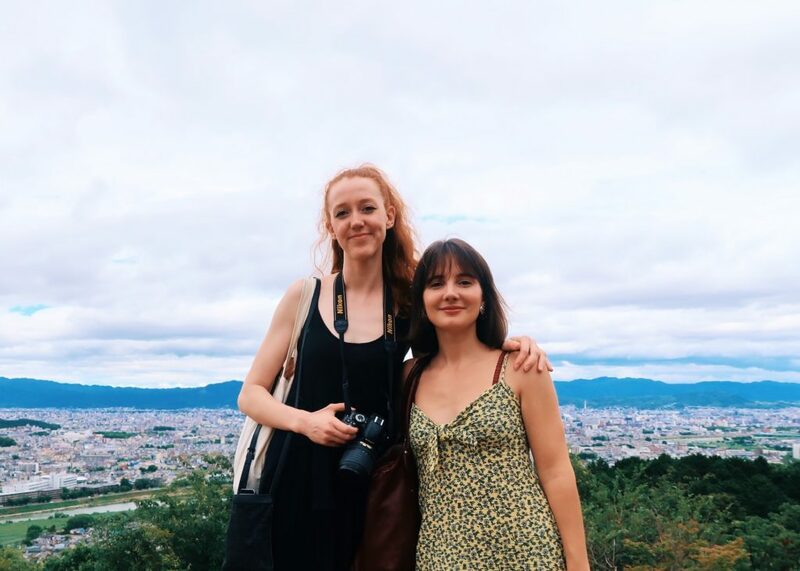 Kima and I complemented each other well – without Kima, I probably wouldn’t have talked to many strangers on this trip, and without me, Kima would potentially still be in Japan because she took a wrong turn and got distracted. I also very much appreciated having a willing photographer with me at all times – no need for selfies on this trip (we all know I love a good pic…or a bad pic, of which there were plenty). 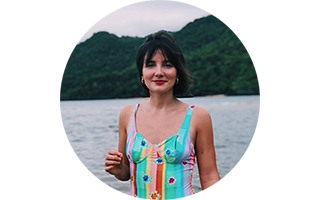 If you’ve made it to the end of this travel diary/itinerary/guide, thank you for your patience, and if you have any questions beyond what I’ve covered in this excessively long post, let me know – very happy to help.